The Return of the King, first published in October 1955, is the final volume of the three-book fantasy epic The Lord of the Rings by JRR Tolkien. It contains the final two books of the narrative, V & VI, as well as six appendices detailing much of the background and ancient history behind the story itself, including a short account of the elder days of Middle Earth, languages, and some genealogical information. 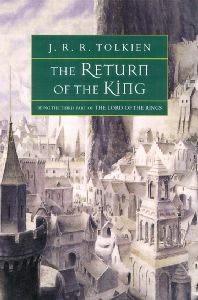 The Return of the King picks up the narrative where it was left at the end of the preceding volume, The Two Towers. Frodo and Sam have crossed the mountains into Mordor. Gandalf and Pippin have arrived in Minas Tirith. Merry remains in Rohan. And Aragorn, Legolas, and Gimli take their own dark path. Events are rapidly progressing to a head, and in this volume the future fate of Middle Earth will be decided. Minas Tirith remains the last real bastion of hope in the west, and it is there that Sauron will strike first…and soon. Not only the plot comes to a head in the final volume of The Lord of the Rings. So too do many of the moral themes that Tolkien had been developing through the previous two volumes. There is an implicit rejection in The Lord of the Rings for an idea that had gained immense popularity during Tolkien’s lifetime. The idea of the sacrifice of the individual good for the collective good. It is not simply a rejection of that ideal in itself, but for the idea that the perpetration of small evils is acceptable if it serves the “greater good”. “We can bide our time, we can keep our thoughts in our hearts, deploring maybe evils done along the way, but approving the high and ultimate purpose: Knowledge, Rule, Order” (FotR pg. 291). Saruman may or may not actually believe what he is saying (though likely not). His thirst for power has driven him across the gulf, to the point where he does not seem to be “deploring evils”. He is no doubt trying to sweet-talk Gandalf here, but the point of this speech remains the same. The idea of perpetrating small evils for the greater (or long-term) good. This theme is repeated, albeit in a smaller way, with Gollum. Throughout the books, Gollum/Smeagol’s life is spared time and again. Frodo comments to Gandalf in The Fellowship of the Ring: “What a pity that Bilbo did not stab that vile creature when he had a chance!” (FotR pg. 68). The Return of the King represents the climax and slow dénouement of The Lord of the Rings, and the appendices present some background information to curious fans who want to know more about Tolkien’s created world. Tolkien himself was torn on the idea of appendices, as he noted in a 1955 letter. He felt the appendices themselves would not satisfy those who had an interest in them, “while those who enjoy the book as an ‘heroic romance’ only…will neglect the appendices, very properly” (Unfinished Tales pg. 2). The appendices, however, did provide a wealth of wonderful background information about Middle Earth, and provide a solid foundation for the posthumously published histories such as The Silmarillion and the rest of The History of Middle Earth series. The Return of the King was adapted into an animated movie directed by Rankin/Bass and released in 1980, to generally lukewarm reception. A large-budget film adaptation of The Return of the King was released in 2003 by New Line Cinemas under the direction of Peter Jackson. The film won 11 Academy Awards and is currently the second highest grossing film of all time (worldwide) behind only 1997’s Titanic.